Kate grew up in a small rural farming town near the northwest border of Illinois and Iowa. At a young age she knew she wanted to live and study in a big city. Shortly after she graduated high school, Kate made the move to attend college at the University of Illinois at Chicago. There she studied art and design and graduated with a Bachelor of Fine Arts in Graphic Design. After graduating college, Kate married her hometown sweetheart on a beautiful fall day in downtown Chicago. Her many interests include design, photography, food and cars and hopes to one day travel to Europe with her family. 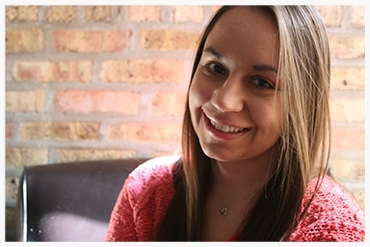 Kate has worked at various Chicago institutions as a photographer and graphic design intern in the automotive and fashion industries. In November 2013, she started working at STUDIO KAST under the guidance and mentorship of Christy Smith. "I absolutely love what I do and am thankful for the opportunity to learn, grow and become a great designer at STUDIO KAST."